Love these patterns ~ would really like to purchase more! Fast shipper - east transaction! Love these patterns! Fast shipper! Amazing seller, so nice and easy to deal with. Again, amazing!! In 1995 while on vacation in Maine, I wandered into a needlework shop looking for something to do while relaxing. I found a cross stitch sampler chart that was quite primitive so I bought fabric, floss, hoop and needles and went back to my cottage and got right to work. My first lesson in reality was realizing that after I completed my sampler, I would have to pay to frame it. Yikes! That would mean I would have to pay someone a fair amount of money to do this. Well, I am known in my circle of friends as being rather frugal (at least to my face, who knows what they say behind my back). Well this was going to bring my fun with my new-found hobby to a quick halt unless I could come to terms with a drawer full of unframed samplers! So I thought about using antique frames. My problem was I knew that I would never be able to get my husband to cut them down to fit my completed samplers. 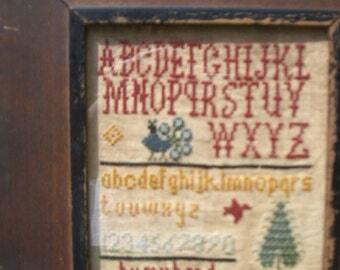 So on to plan B. I decided I would have to learn to design samplers to fit the frames. This would not be an easy task for me since I would be forced to do math (ugh!). I would have to calculate how many stitches would fit across and down to fit in the frame. I burned valuable and irreplaceable brain cells in the process. Next I had to figure out how to plot the designs. Not realizing there were easy-to-use software programs out there for just this purpose, I took the old-fashioned approach and resorted to making X’s and O’s on graph paper. This went on for a long time until my daughter started rolling her eyes at me (you know what I mean) and set me up in Excel. What a difference. I still design in Excel. After too many (according to my husband) samplers were showing up all over our house, he suggested I start to sell them. That led to selling finished samplers at local shops then, upon a request from a customer, creating and packaging charts, then opening a website. I am happy to be on Etsy now where I find a supportive atmosphere from both my fellow sellers as well as buyers. All my life I have been creating. My primary interests lie with folk art but especially samplers, Rufus Porter and Moses Eaton-painted items, hooked rugs and country painted items.